Sneha Thakor Desai, Assistant Regional Census Manager for Partnership, U.S. Census Bureau; Nhi Ho, Partnership Team Leader, U.S. Census Bureau. Photo by Cynthia Pena. 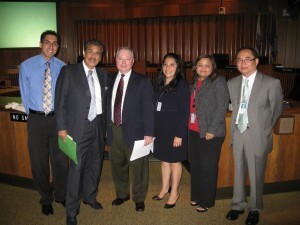 The U.S. Census Bureau held the first City of Santa Ana Complete Count Committee (CCC) Kickoff event of the year today at 1pm at the Santa Ana City Council Chambers. Santa Ana Mayor Miguel Pulido has appointed leaders of non-profit organizations, businesses, faith-based organizations, and schools to form the committee. The role of the Complete Count Committee is to plan and implement a locally based outreach and promotion campaign designed to raise census awareness and increase the participation rate in the city of Santa Ana by publicizing the importance of responding to the census. Why does this matter? “The federal government uses census data to help distribute hundreds of billions of dollars to cities every year. Census numbers also help draw the lines for Congressional districts,” according to the O.C. Register. Councilwoman Claudia Alvarez understands the importance of making sure we count everyone in town – including immigrants who don’t have legal status. 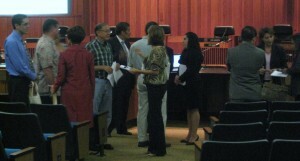 City of Santa Ana Complete Count Committee Members strategize ways to reach out to Hard-to-Count Communities. Photo by Cynthia Pena. Undocumented immigrants and other hard-to-count people do use some city services, Councilwoman Claudia Alvarez told the O.C. Register, and they need to be counted so the city can get all the federal funding it can. “They use our sidewalks. They use our firefighters, they use our police force,” said Alvarez. You can check out sample Census questionnaires at this link. And click here to learn more about the 2010 Census. The Census workers are out in Orange County now doing a paper audit of last springs housing address update. Happy to say that the Santa Ana listing group was the first to turn in completed work, beating out Fullerton by 2 days and Newport Beach who haven’t even started.